Please visit my new blog at http://www.knightsofdivinemercy.com/. With the article written in the National Catholic Register, shown in my previous post, I have made the decision that the time has come to focus the technological side of my ministry on this amazing apostolate for men’s faith formation. All are welcome to visit the blog at http://www.knightsofdivinemercy.com/, but we are encouraging the men to make comments and get the discussions going. Mary’s Anawim began on July 7, 2007 (07-07-07), which was the same day our Holy Father, Pope Benedict XVI took a giant leap forward in helping our Church recover a sense of the sacred by issuing his Apostolic Letter Summorum Pontificum issued Motu Proprio. For those of us who have been drying up in the desert of secularism, this seemed to be the beginning of very exciting times – truly the first buds of the springtime of the New Evangelization. 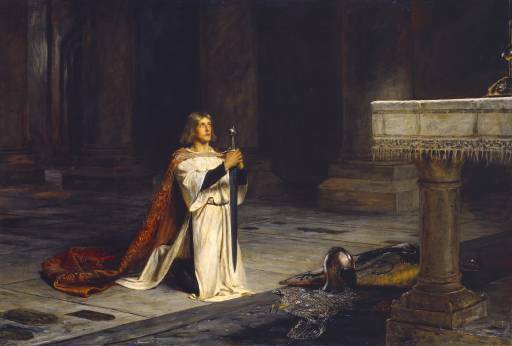 In the picture above you see a knight kneeling in submission before the altar of God. That is the ‘state’ we are always seeking as the Knights of Divine Mercy. Our motto, Deo submissus in Deo potens (the one who has submitted to God is powerful in God), asks us to be humble, teachable, and willing to be led. At this point in my ministry, as we all campaign to recover a sense of the sacred in this new springtime, I feel my role – my call – is to do all I can, within the power God has given me, to raise an army of ‘SOLID’ men who are willing to enter the fray of secularism and pull out the lost souls of our family and friends (“I will never leave a fallen comrade to fall into the hands of the enemy” –United States Army Ranger Oath). The deprogramming of our loved ones from the secular indoctrination begins by raising an army of those who are truly taking their faith seriously. Without this example of conviction and resolve, there is little or nothing compelling our loved ones to come home to their faith again. And so the Knights of Divine Mercy begin, first, by working at their personal holiness. Please pray for the Knights of Divine Mercy. And, if you please, I’ll take a few of your prayers too as we step out in reclaiming surrendered ground. This entry was posted on Monday, September 6th, 2010 at 8:34 am and is filed under Uncategorized. You can follow any responses to this entry through the RSS 2.0 feed. You can leave a response, or trackback from your own site. May there be many knights in shining armour in the army of Christ. Thanks Fr. Rick. I’m pray’n for all of us Knights for courage and holiness!!! God bless all and thank you Father Rick for following the promptings of the Holy Spirit! “A Knight Must Be Willing To Be Led � Mary\�s Anawim” seriously causes me personally contemplate a somewhat more. I actually admired each and every individual piece of it.